In this guide, we’ll look at the elements that shape the flavor of a #bourbon. Then we’ll look at different styles and bottlings of bourbon. I have included tasting notes for a selection of some of the best bourbons on the market. Finally, I have included links to some of our best bourbon #cocktail recipes. Feel free to try making these at home or asking your favorite bartender to mix them up for you. This can really help you learn to explore the full range of flavors that can be coaxed out of a spirit. This guide is intended to be a reference. Feel free to skip around and explore whatever interests you. If you want to read it straight through that’s fine too. Bourbon must be produced in the United States. Made from a grain mixture that is at least 51% corn. It must be aged in charred new oak barrels. Barreled for aging at no more than 62.5% alcohol by volume. Bottled at least 40% ABV. The reason people place an emphasis on the regulations is that they provide the framework that makes bourbon a unique style of whiskey. The problem is that they don’t tell us much about the way bourbon tastes. They are even less helpful in selecting a particular bottle and offer nothing on the most enjoyable ways to drink it. You will sometimes hear people refer to the mash bill when they talk about bourbon. The mash bill is the mixture of grains that go into the whiskey mash. This is the recipe for bourbon. Understanding the mash bill is a great place to start looking for your best bourbon. Bourbon by definition has more corn than anything else in the mash. There are a few 100% corn whiskeys available but a bourbon’s flavor is usually shaped by a mix of barley, rye or wheat. There are three main styles, or mash bills, that almost every bourbon producer adheres to. A distiller may vary the percentages by a few points, but the basic styles remain the same. The high sugar content of corn gives bourbon its distinct sweetness. The starchiness of corn also yields a high percentage of alcohol per bushel of grain. What is surprising is that corn adds little to the flavor of a finished bourbon. Unaged corn whiskey tastes a like popcorn but years of aging neutralizes the corn flavor. Barley makes up less than 15% of the mash bill of bourbon. It contains enzymes that help in fermentation. While it does add some malt and chocolate notes to the final product it is not used as a flavoring grain. Rye and wheat are the grains that shape the flavor of bourbon. Distillers will often refer to these as the “flavoring grains”. Earthy spice and fruit notes in a bourbon come from the addition of rye. Rye is a rich flavorful grain. It can add black pepper, baking spice, and some dried fruit flavors to a bourbon. Rye gives bourbon its distinctive ‘bite’ and ‘rough around the edges’ character. Wheated bourbons are common now, but no too long ago adding wheat to bourbon was a renegade practice. Wheat softens and rounds out the flavor of the spirit. Wheated bourbons taste sweeter. This is not because the wheat itself is sweet but it allows more corn and vanilla flavor to come through. There are three bourbon mash bills you’ll find in the products on Cascadia’s shelves. There are classic bourbons, high rye bourbons, and wheated bourbons. Each of these grain blends shapes the flavor of the spirit. Before we look at the grain blends it helps to understand what each grain does to the final flavor of the mash. The traditional bourbon is 70 – 80% corn, 5 – 15% barley and the rest rye.The corn is neutral and sweet. Barley has enzymes that help convert starch to alcohol. Barley also adds some malty, biscuit and chocolate notes, but rye is the flavoring grain. Bourbons with a classic mash bill are some of the oldest and most well-known bottles on the shelf. These include Jim Beam, Wild Turkey, and Evan Williams. Premium brands include Buffalo Trace, Elijah Craig, Booker’s, Eagle Rare and Knob Creek. In a high rye bourbon, you will find twice as much rye as a traditional bourbon. The added rye replaces some of the corn in these whiskeys. These bourbons are less sweet, have richer flavors and more pronounced spice notes. Bulleit, Woodford Reserve, and Basil Hayden are all high rye bourbons. Wheated bourbon takes the traditional bourbon recipe and substitutes wheat for rye. Wheat emphasizes the sweetness of the corn and the flavors of the barrel to come through. These bourbons are softer, sweeter and rounder in flavor. Wheat bourbons include Maker’s Mark and WL Weller Reserve. The other half of bourbon flavor comes from aging the spirit in charred new oak barrels. Adds flavor – vanilla, caramel, maple, cloves, toffee, cinnamon, toast, nuts, and fruit. The exact flavors that aging adds to the bourbon are subject to many variables. The most obvious being the amount of time the spirit spends in a barrel. Others include temperature variation, the placement of the barrel in the rackhouse, and variations in the wood. These factors are all managed to match the whiskey’s flavor profile. The vanillins, tannins and flavor lactones in bourbon take about six years to develop. Most bourbon matures somewhere between 8 and 15 years old. High rye bourbons tend to mature a little earlier than wheated bourbons. An age statement on a bourbon is a declaration that the youngest spirit in the bottle is at least the age on the label. It is possible that a distiller may blend in much older spirits. In practice, most of it will be close to the stated age. As with other aged spirits, higher quality spirits are often aged longer. This doesn’t mean a bourbon’s age is a defining marker of quality. There are many great bourbons that are both younger and older. An age statement is an easy point of reference for many consumers. As a result, bourbons older than 15 or 20 years are rare and command exorbitant prices. Elijah Craig 12-Year-Old Small Batch is a good example of the flavors that develop over a decade of barrel aging. The bourbon rich and warm. You can make out notes of spiced vanilla and baking spices. Toasted oak comes through along with pleasant hints of barrel char. As long as a whiskey is at least four years there is no legal need to put an age statement on the bottle. The decision to put an age statement on older bourbons is a marketing decision. The decision to include an age statement is often driven by demand and inventory levels. If a producer has an excess capacity and they think it will help sales they may add an age statement. When inventories drop a distiller may drop or change the age statement. Over the years distillers added, changed and removed age statements on many whiskeys. Large brands blend thousands of barrels in a bottling. This reduces variations between barrels and helps produce a consistent product. Small batch and single barrel producers create unique bourbons by exploiting these variations. Cask strength bourbons go a step further and bottle whiskey straight from the barrel. Small batch bourbons are a newer category of premium bourbon. The term is not well defined. Generally, distillers use fewer barrels in these bottles than they do for a major brand like Jim Beam. A large brand will blend a bourbon from thousands of barrels. Some small batch bourbons advertise that they use less than 200 barrels. Others claim to blend from less than a dozen hand selected barrels. Jim Beam pioneered the small batch category with the introduction of Knob Creek in 1992. Booker’s, Baker’s, Basil Hayden are all small batch bourbons also produced by Jim Beam. Woodford Reserve and Maker’s Mark are two other small batch bourbons worth tasting. 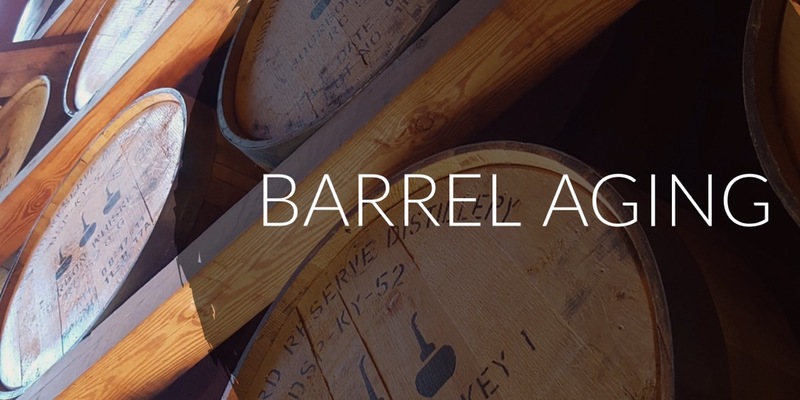 In contrast to small batch, #single barrel bourbon is a more clearly defined term. A single barrel bottling contains only the best bourbon in a batch sourced from one single barrel. The bourbon is not mingled with the spirits from any other barrels. A bourbon barrel contains enough liquid for 150-200 bottles. The distiller will select barrels that fit the brand’s flavor profile. Of course, each barrel will vary in flavor from one bottling to the next. Each bottling is unique like different vintages of wine. Knob Creek Single Barrel Reserve is a robust spirit with rich caramel and spice notes. Evan Williams Single Barrel emphasizes the vanilla notes a little bit more. Cask Strength (or barrel proof) bourbon is the proof at which they come out of the barrel. Distillers put bourbon in the barrel to mature a little less than 62.5% ABV. Distillers water spirits down to bring them to bottling proof. They put bourbon in the bottle around 40-45% ABV. A distiller won’t proof down a cask strength bourbon. Instead, it is bottled at the strength it is when it comes out of the barrel. Some of the best bourbons on the market are cask strength bourbon. These are big, rich, full-flavored bourbons that have a lot to offer the whiskey lover. Booker’s is a fantastic example of cask strength bourbon. Basil Hayden is the softest and lightest flavor of the three bourbons in Jim Beam’s Small Batch Collection. Its approachable flavor makes it the perfect place to begin exploring the world of bourbon. It starts with delicate spice on the nose. This bourbon has a smooth, round and balanced mouthfeel. Notes of fig, plums, and cinnamon add depth. Overall a nuanced easy drinking bourbon. Evan Williams Single Barrel is a classic single barrel bourbon. Hand selected 10-year-old bourbons are getting more difficult to find. This one is a great selection for the price. It has lots of oak and vanilla flavor with moderate sweetness and hints of butterscotch. Evan William’s gives you a mature flavor filled whiskey at an affordable price. Woodford Reserve is a high rye bourbon notable for having a very low barrel entry proof. The result is a very warm rich bourbon. Spicy chocolate, leather and butterscotch notes dominate the nose. The flavor brings more rich warm flavor. Baking spice, vanilla, rye and wood all show up. It finishes well with lots of toffee and oak. Maker’s Mark is the classic wheat bourbon with the distinctive hand-dipped red wax top. It claims to have the lowest distillation proof of all bourbons. This shows up in its rich flavor. Maker’s Mark is a substitutes wheat for rye in the mash giving this bourbon a smooth, rich sweetness. Maker’s delivers warm sweet honey, vanilla and butterscotch notes. Elijah Craig 12 Year Small Batch is a showcase for all the good things that come from oak barrels. The full range of vanilla, coconut, caramel and wood flavors that come from new American oak make an appearance here. This whiskey is a warm, rich lingering hug. The high demand for this bourbon is placing pressure on stocks. It is no longer available in the US. Buy it while it is available. Booker’s is the barrel proof expression of the Jim Beam Small Batch Collection. Booker Noe, Jim Beam’s grandson, lent his name to the bourbon. It started out as bottlings of hand-selected bourbon that the former Beam master distiller would give out as gifts. Booker’s goes in the bottle at its natural proof. This is between 120 – 130 proof. This bourbon is packed with rich, powerful flavor.